Performance Capture (the total recording of a performance using a motion capture system) was first used in 2004. It is inherently theatrical, since a performance is filmed in its entirety – without multiple takes of a single scene. Actors wear suits with markers to help computers track their movements during the scene. Over the last decade, we’ve seen a resurgence of cinematic apes, with a full reboot of the Planet of the Apes franchise, a couple of King Kongs, and more than one Tarzan. But the monkey suit has shifted from a furry outer layer to the modern motion capture suit as actors such as Ace Ruele in The Legend of Tarzan (2016) and Notary (alongside Serkis and others) in War for the Planet of the Apes (2017), Dawn of the Planet of the Apes (2014), and Rise of the Planet of the Apes (2011) transform how they perform – and we consume – monkeys on the screen. 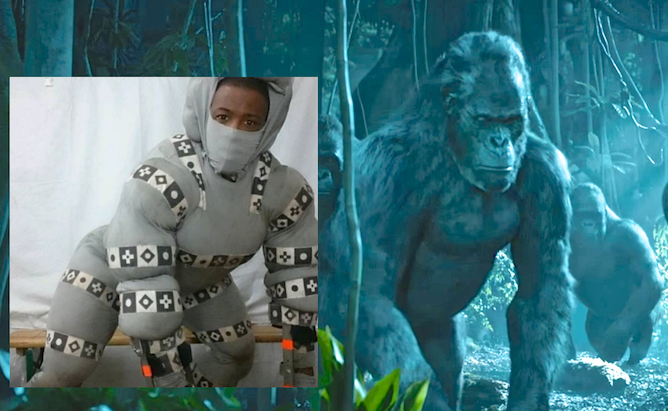 A motion capture suit worn in The Legend of Tarzan. Author provided. This system is built around the aspirations of Stanislavski – the father of method acting. It includes embodying the emotional state of the primate via practising regimented gait and walk cycles and using specific breathing techniques and even numbered approaches to gaze and smell. So, for instance, the scent of another primate in the distance would be given a number and a correlating pose, which ape actors would be instructed to adopt. Banner image: Andy Serkis as Caesar in War for the Planet of the Apes. Chernin Entertainment, TSG Entertainment.